This year, € 15 million has been earmarked for the treatment of hepatitis C, but only six million euros were spent in the course of half a year. At the same time, in Latvia, the "pre-treatment" of patients is still in effect – only patients with hepatic impairment due to hepatitis C are more likely to receive treatment with advanced medications. Patients with hepatitis C, but the health problems are not yet serious for this reason, the state it is not possible to receive paid treatment for new medicines, therefore chooses to pay for the medicine by ordering it outside the European Union and by mail. Patients are not always protected by choosing such a survival strategy, as the doctors are not obliged to monitor the treatment of these people, and in Latvia there is also no guidance whatsoever to take if the patient is ordering medicines online – whether they are safe or whether they can be used by the patient based on their health pregnant. The Hepatitis Society is alarmed by the slowdown in government budget spending, which in theory may encourage a reduction in the amount to be allocated next year, and for patients who can not expect government-paid medication to pay for themselves and purchase medicines in India. 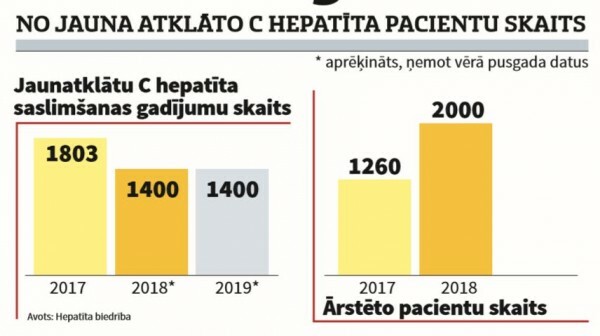 The number of people who have hepatitis C in Latvia is not well known, but there is certainly a lot of people who are diagnosed with hepatitis C.
Last Hepatitis C was detected in 1803 patients, but estimates from the Hepatitis Society show that there will be 1,400 patients this year. The number of treated patients last year was 1260, this year it was planned for 2000. One third of the cases of hepatitis C infection are unknown, in which cases this happened, but one fifth of the patients were infected with healthcare services that is more than sexual contact or intravenous drug use , which is often considered the main type of infection. "Unfortunately, it can also be infected due to medical processes, which we see according to the patient's narration and the history of the disease, when the incubation period coincides with the treatment," says Velga Ķūse, the head of the Latvian Infectology Center. Hepatitis C most commonly occurs without yellowing, which usually refers to hepatitis in humans, therefore most patients find it accidentally. The doctor reveals that hepatitis C has at least 11 genotypes, and the determination of the genotypes of patients treated at the Center for Infectious Diseases of the Latvian Infectology Center shows that in Latvia the most patients with the first genotype (64 percent) and the third genotype (32 percent) are the most. Identification of genotypes is important because certain drugs are effective for certain types, but currently there are also available medications that are suitable for treating all types of hepatitis C.
Recalling the history of hepatitis treatment, V. Kūse indicates that hepatitis C was started treatment in 1986 with interferon preparations, which "we call conventional or conventional interferons, the treatment was long and severe." In contrast, ribavirin appeared in 1998, an antiviral drug that could be added to interferon, but in 2000, pegylated interferon, with which treatment was long and with side effects. Direct acting antiviral drugs that appeared in 2016 caused a certain revolution in the treatment of hepatitis C, since treatment effectiveness is 97-99%, shorter treatment times and no side effects. Treatment of hepatitis C in Latvia with advanced drugs, was started by identifying the priority groups for receiving these medicines and until now hepatitis C patients with heavier hepatic impairment – fibrosis in the third and fourth stage, and from this year – also patients with fibrosis in the second stage. Hug says that up to now 25 consoles have been held, handling 1,061 cases of hepatitis C treatment with state funding and 140 cases where patients pay for themselves. Most patients (785) have been prescribed a drug that is suitable for any genotype of hepatitis C (the so-called pangenotypic) and whose course of treatment is 12 weeks. The doctor confirms that those who choose to pay for themselves are patients with lesser hepatic impairment at zero, first or second stage, because the state does not prescribe state-funded medicines for these patients. True, at present state-paid treatment can also be received by patients with a second stage of fibrosis due to additional funding. After the consensus, the decision of the National Health Service on the granting of treatment must be received – 959 decisions have now been received and treatment started in 767 patients. Treatment completed in 530 patients. Why do not treat more patients? This year, EUR 15 million has been earmarked for treating hepatitis C, with six million euro spent this six months. Hepatitis society leader Kristaps Kaugurs says: if money is not an obstacle, and funding for hepatitis C treatment is significantly higher than in other years, why not treat more patients? Are there any bureaucratic obstacles? "Why in this situation there are no expanded groups of patients eligible for modern hepatitis C treatment and do we have any hope that patients will receive this treatment in any situation?" Asked Kaugurs. Jana Feldmane, Head of the Health Department at the Ministry of Health that medicines are expensive, so it is important that decisions are made by competent and qualified doctors. "We have solved the question that treatment should be available not only in Riga, but also in the regions of the hospital. Daugavpils and Liepaja regional hospitals have shown their willingness to take hepatitis C patients, "says J. Feldmane, stressing that" it was necessary to set patient priority groups because funding was limited ". The specialist believes that it was and can be done because hepatitis C is a chronic illness, and this year the state has already taken a step towards the patients by providing treatment in patients with stage II liver fibrosis. She also stressed that the decision was taken with hepatologists. Straudin Hospital Infectologist Pauls Aldiņš, pointing out that patients who are not on the so-called list of priorities seek to find an alternative and buy medicines outside Europe, emphasizes: "Talk about when we need to remove the restrictions and at what point we will be ready to say that we will treat everyone. "A. Feldmane says: you do not need to run the wheel ahead. Patients' proritisation could be reviewed after analyzing the data for the current year and looking at the budget options for the coming year. The Hepatitis Society, meanwhile, is complaints – wait a long wait in the queue for an infectiologist, wait for a consular opinion, wait for the response from the National Health Service, and only then can get treatment … It can also affect the slowdown of money for Hepatitis C.
However, both the Ministry of Health and the National Health Service are in the opposite view. Zinta Rugja, Head of Medicines Evaluation Department at the Department of Medicinal Products and Medical Devices, said that all the funds are being mastered and they do not have a problem. The service can decide even if it is necessary even during the day. The Ministry of Health, for its part, is not aware of cases where the capacity of doctors is not enough to accept all patients, patients do not have to wait long lines. How to get infected with hepatitis C (%)?